Mahatma Gandhi, the man who won us independence is Gujarat’s gift to India. Prime Minister Narendra Modi who flagged off the country’s year long, high profile celebration of the Mahatma’s 150thbirth anniversary on October 2,2018, hails from here as does Amit Shah who runs the ruling BJP .There are two state Governors and additionally a long line of bureaucrats, technocrats and politicians from the state doing duty in Delhi and around the country. Two days before he kicked off the India-wide celebrations, the Prime Minister spent a busy day in Gujarat on September 30 with a slew of back to back engagements. One of them was the inauguration of the world class museum at the Alfred High School in Rajkot where the Mahatma had studied. Just two kms from it is the Rashtriya Shaala, a 97-year-old school founded by Gandhiji which closed down for want of funds two months ago. There were over a thousand students at one time but the government during the present Prime Minister’s tenure in the state did not find the primary school and the classical music school grant-worthy. Request to corporates for donations failed to get the desired response and the institution closed down. Interestingly, chief minister Vijay Rupani hails from Rajkot and the present vice-chancellor of the Gandhian Gujarat Vidyapith, Dr Anamik Shah is also a product of the Rashtriya Shaala. And the thrust of the Prime Minister’s speech was that past regimes had ignored Gandhi! Inaugurating the Rs 300 crore chocolate plant of Amul, near Anand, India’s milk town, on the same day ,the Prime Minister was himself guilty of ignoring the late V Kurien, the father of the cooperative milk revolution in the country and the man who made Amul possible. There was not even a picture of the man. Not wholly unexpected, for a piqued chief minister Modi had ensured his ejection from key positions including Institute of Rural Management, Anand (IRMA) and Gujarat Cooperative Milk Marketing Federation (GCMMF). Incidentally, the day Kurien passed away, Modi was present at a function in the vicinity of Anand but remained straight-faced even when informed and moved on. Old timers sorely missed Kurien when they witnessed the dairy cooperative members being given a miserly eat while the VVIPs enjoyed a Rs 2500 per person lavish meal spread,at the function! 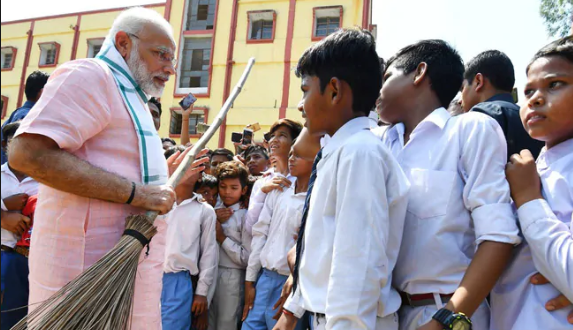 Though Prime Minister Modi is the present messiah of the Swachh Bharat movement, interestingly, it was Mahatma Gandhi who had launched the biggest sanitation drive in the history of Ahmedabad in 1919, cleaning almost 3000 tonnes of garbage. Thirteen plus years of Modi’s helmsmanship and four years of his successors later, Gujarat accounts for three of the country’s most polluted rivers and Pirana in Ahmedabad as one of the most toxic garbage dumps. Spread over 84 hectares this dumping yard of 1982, today constitutes three 75 feet high massive mounds of garbage each weighing 69 lakh metric tonnes. Highly toxic, spewing methane and carbon dioxide, it requires 48,000 litres of water per day or 17.5 million litres of water per year to keep under control. And 4700 tonnes of garbage is added to it every day. Air-conditioners ,5 km away from the landfill site, are developing leaks due to corrosion. Studies reveal massive groundwater pollution in the vicinity over four decades. Please remember that Ahmedabad stands sixth in the country in per capita plastic waste generation. So it is that a 2012 consultancy study aimed at a zero-waste city by 2031 undertaken at a cost of $ 20,000 is long forgotten and gathers dust while a veritable time bomb ticks in Ahmedabad’s backyard! On September 20, a National Green Tribunal (NGT) order, quoting a Central Pollution Control board (GPCB) report had bad tidings for the state. Of the 351 polluted river stretches in India 160 were in five state of Gujarat, Assam, Maharashtra, Kerala and MP, Rajkot’s Bhadar stretch being India’s third most polluted. In Vadodara, Mahi and Dhadhar river are in death throes and domestic sewage is sending Tapi river, off Surat city into convulsions. Gujarat is among the top lethargic states in dealing with untreated domestic sewage and industrial pollutants. The crowning irony, Gujarat was first in Asia to form a Climate Change department and was last to suggest a climate change plan in the country! BJP has been ruling Gujarat for close to a quarter century and is thus culpable for both acts of commission and omission in the state. It’s failure in submitting Coastal Zone Management Plan (CZMP) as mandated by the NGT, has resulted in projects worth Rs 50,000 crores being held up. This is because the NGT has directed the Ministry of Environments and Forests (MoEF) should not grant development permission in the regulated areas unless CZMP is submitted. It is only after the hollering from the NGT on September 20 that Gujarat has finally agreed to formulate a river rejuvenation policy. Gujarat had all along chosen to be deaf to the Union water Resources ministry request for a list of lakes, water bodies and their current status. This despite the fact that in 2005,the state government had notified 44,138 lakes. Thus, it is that the Prime Minister’s own home state and one that he projects as a model for the country, does not present a flattering view of his own rule!